Enjoy up to a 20% discount on the cost of joining the Smart Betting Club this ‘Black Friday’. To celebrate the fact that its ‘Black Friday’, all day today we are offering you the chance to save up to 20% on the cost of a Smart Betting Club membership. But be quick as these discounts are only available until midnight tonight (the 27th November 2015). Save 20% On The Fink Tank Too! Don’t forget either, you can also save 20% on the cost of joining our fantastic Fink Tank Football Service until Midnight tonight! Save 20% on a Fink Tank membership and access these profitable football tips by using this coupon code: FINK20 via the Fink Tank page. Think you have got what it takes to be a profitable Football Tipster? Keen to prove your tipping prowess and and earn a paid contract to supply your advice to SBC members? Well if so, step forward and enter our new Football based ‘Britain’s Got Tipsters‘ competition as we are on the lookout for fresh betting talent! What Is Britain’s Got Tipsters? Britain’s Got Tipsters is a special contest where we are on the hunt for quality football tipsters keen to showcase their tipping skills. Here at the the Smart Betting Club we firmly believe there are many as-yet-undiscovered betting experts out there, who simply need a helping hand and the right platform to showcase their skills. Earlier in 2015 we ran a very successful horse racing Britain’s Got Tipsters contest, where 12 tipsters fought it out over a 3 month period to prove their racing tipping expertise. The contest was a real success with a number of profitable tipsters uncovered, such as The Form Analyst & Chris Patti who continue to provide their tips for free to SBC members each day. The top 3 racing tipsters made a 127 point profit at a ROI of 14.23% from 1500 bets! After the success of the racing contest, it makes perfect sense to now hunt down the best football based tipster, hence the launch of our Britain’s Got Tipsters Football contest. The eventual winner of the contest will be offered a paid contract to supply their betting advice to SBC members and to join our existing network of expert tipsters (such as The Form Analyst & Chris Patti) who already provide similar free tips to SBC members via our private betting forum. Our Football Britain’s Got Tipsters contest will run from December 2015 until the end of May 2016. During the length of the contest, each tipster taking part will be asked to proof their bets live on the SBC Forum. Tipsters will be welcome to put forward advice on any football leagues or competitions they choose. If you can bet on it and make a profit, then we want to know! Unlike other talent shows we wont be having ‘eliminations’ or knock-out rounds as we are keen to allow each tipster the time to prove their ability. We feel that between the contest’s start date (expected to be in December 2015 – although this will only be confirmed once a shortlist of contestants is finalised) until the end of May 2016, we will be able to get a very real flavour of just how each tipster works, their football expertise & professionalism, attention to detail and of course – if able to showcase a profit. To help keep track of performance, we will also be posting regularly updated results spreadsheets for each tipster and league tables so you can view the best performing. The goal naturally is to find not just any old tipster, but the most serious, professional and reliable expert going – exactly the type of tipster you feel confident about following with money. In a nutshell the type of tipster we might enter into our Hall of Fame – those we recommend to make you money. To ensure the contest is fair, we will be allowing tipsters to put forward single football bets only (meaning no pie-in-the-sky accas that might get lucky). No ante-post bets will be allowed nor special bookmaker offers or concessions. Each tipster will only be allowed to quote prices from a set group of ‘approved bookies’ (so definitely no Betfred or Stan James) and availability of any advised odds quoted will be double-checked for accuracy. Tipsters will be welcome to put forward bets advised with so-called ‘Asian’ bookmakers such as Pinnacle Sports and SBOBet, yet should be aware that UK punters are unable to use many of these firms. Odds availability of any tips put forward will be a crucial factor when the judges evaluate the best candidates. Each tipster must utilise their own staking plan and Return on Investment (Yield) will be the primary gauge of success, not simply a profits tally. We will also take into account the potential for betting bank growth with each tipster. Based on the applications received, we will then build up a shortlist of those that make the grade and will be invited to take part in Britain’s Got Tipsters Football. Once we have developed this shortlist, the starting date for the contest will be announced. The contest is not limited to just those based in Britain either, as just like the talent show, anyone can take part from all around the world. If you are a good football tipster we want to know about it full stop, whatever the leagues you bet in. If you already run a commercial based tipping service, you are also welcome to enter, however you must put up different tips to those on offer elsewhere. After the contest period has elapsed, the SBC panel of experts will decide upon the ultimate winning tipster. He or she will then be offered a paid contract to supply their tips exclusively to SBC members and join the many free tipsters on offer via our website. If you like the idea of this contest and following the tipsters we shortlist to take part, then you will be able to do so with a Smart Betting Club membership. This is because all qualifying tips will be posted on our private members only betting forum, which you gain full access to with a Smart Betting Club membership. So if this contest interests you in terms of following the high quality of tipsters expected to take part – make sure you join the Smart Betting Club today! The Complete US Sports Betting Package Out Now! Earlier this week we released the 4th and final SBC US Sports Tipster Report, designed to help you make money betting on all things Stateside. The release of Issue 4 helps to complete our full US Sports Betting Package and if you are keen to get started making money betting stateside, it is essential reading. Not only this, but our unique how-to-bet guides will explain just how to punt on each of these sports – perfect if you are totally new to them! Exclusive Review 2) The popular NBA tipster hitting 4.2% ROI long-term and averaging around 44% betting bank growth each season. Our review identifies a simple tweak that can almost double the ROI to 8.3%. Exclusive Review 3) The NHL Tipster with a 246 pt profit (10.7% ROI) from 519 bets last season. Most impressively of all, our odds testing indicates you can actually improve upon the advised prices. How-To-Bet-Guide: NFL Never bet on American Football in your life? Don’t worry as our NFL guide will explain how the game works, player positions, competition structure and most important exactly how to bet upon it. You can now sign-up and receive all 4 of our US Sports Tipster Reports (including Issue 4 detailed above) as a Smart Betting Club member. Not only will you gain access to all of the best US Tipsters we have uncovered but unique how-to-bet guides on NFL, NBA, MLB & NHL – the 4 main US sports. These US Reports are only available with a membership, which will not only provide access to all 4 US Sport Tipster Reports, but also our entire professional betting package including…Regular UK & European Sport SBC Magazines – Find out just who the best tipsters actually are for Horse Racing, Football (Soccer), Golf, Tennis & Rugby via the independent reviews published in our regular SBC magazines. Includes full access to our 9-year+ back catalogue! Regular ‘Tipster Profit Reports’ – Published several times a year, these unique reports contain our latest tipster ratings, including Hall of Fame and at a glance comparative league tables for over 50 of the most profitable tipsters. Pro Punter Bet Diary – Follow real-life guidance on how to make a profit using tipsters with our very own Bet Diary as penned by a full-time betting professional. Massive Tipster Discounts – Gain access to a large number of exclusive special deals, free trials and large discounts on many of the very best tipster services. Grab Our Best Systems & Guides FREE – Enjoy access to our fantastic Ultimate Betting Package – jam packed full of systems, strategies and expert guides to help you and your betting. Full 30-Day Money Back Guarantee! – Last but no means least, Platinum Membership also comes with a full 30-day money back guarantee if not satisfied with our service for any reason! Out with the old and in with the new…find out where the Pros are placing their bets! One of the most common concerns these days for many punters is that some of the major bookmakers are restricting, or even closing, their accounts. The savvy gambler who knows how to make a profit from his investment, i.e. the typical Smart Betting Club member, is not exactly the type of mug that some of these big traditional bookmakers want as a customer. No. They want to get their customers to play in their online casinos or on the bingo games, where they know they will make their money. Even better, they want you playing on their FOBTs where there’s not a hope of you profiting in the long term. But if you can’t get a decent bet on at the likes of Ladbrokes or Stan James if winning too often, then how can you make any decent money from your betting? Our Pro Punter Bookie Report will tell you two ways you still can! Able to get a bet on. No restrictions because you’re winning. Access to a wide variety of sports and markets. Strong market liquidity so odds don’t crash. Hold a UK Gambling Commission licence so UK punters can get their bets on. In our Pro Punter Bookie Report, which you can download for free via this link, we ran interviews with two companies that are meeting more and more professional punters’ betting needs. As a result, they are going from strength to strength. Professional bettors are giving up on the tired old names of the bookmaker world, and they are leaving behind the prohibitively high commission rates charged by the more established betting exchanges. To get a bet on, and not be scared about restrictions and closed accounts, more and more people are going to…Smarkets, and Matchbook. Smarkets And Matchbook – The Future Of Betting? We found our interviews with the reps from these two companies to be very revealing, and we came away both impressed and confident that here were the solutions to many of our members’ problems. Sick of paying 5% commission at Betfair? We found that Smarkets charge 2% on winning bets only, and Matchbook charge their UK customers just 1.15% commission on volume. It looks like there are new kids on the block, determined to freshen up the bookmaking world, and we, as punters, will benefit. If you really want to take advantage of the benefits Smarkets has to offer, then sign up to the SBC today! SBC members will enjoy a special 1% commission on all winning bets with Smarkets for their first week of betting PLUS a £10 risk free bonus. It’s probably the simplest bonus available – just start placing your bets and the bonus automatically refunds your first £10 in losses, direct to your account, in cash. Improve Your Betting With Our Help…Or Your Money Back! Here at the Smart Betting Club we believe so strongly that we can help ANYONE vastly improve their betting…that we offer a full money back guarantee if not satisfied by our service for ANY reason. This offer is available to anyone choosing our Gold or Platinum membership options as we believe that over a 12 month membership period, you will firmly reap the benefits that the Smart Betting Club can bring you. In fact, we have offered this no quibble 30-day refund for several years as part of our guarantee to you that we are serious about how we can make a difference to your betting bottom-line. There is no small-print to this offer – all we ask is you give our service a try for 30 days and if not for you, then you can get a full refund for any reason whatsoever. How Our Service Can Help YOU! So you might well be thinking, how exactly can our service genuinely help your betting? Tipsters have been around for years but its only though our independent research and reviews that finally punters have been able to discover the ones who can really make it pay long-term. I am not talking about the usual suspects we all know about such as Pricewise or Hugh Taylor, but genuine bonafide experts that you probably won’t have come across before. You can find about each of these via our regular betting magazines and tipster profit reports, which reveal to you not only the best tipsters but also their ongoing performance record. For example, check out the top 5 horse racing tipsters table below, which lists the top performing tipsters from the last 12 months if working to a £2000 betting bank. This is after each tipster’s subscription fees have been deducted so is completely realistic. Not only this but it also includes other key figures such as Return on Investment (12 month ROI) and Return on Capital (12 month ROC). We have blanked out the names as this is for full members only, but as you can see – the top tipsters are making an excellent profit. You can also now follow other punters and their own real-life quests to make money with tipsters via our Practical Punter Reports & Bet Diary. This enables you to check out the tipsters they follow and just how they navigate the world of profitable betting in real-life! …Make Huge Savings On The Best Tipsters! Not only do we uncover the best tipsters as detailed earlier on, but also negotiate huge savings deals on the cost of joining them – ensuring you have more money in your pocket to bet with. Whether its saving you £100 on the cost of a full seasons subscription or some exclusive free trials, very often you can save more than the cost of an SBC subscription with these special deals. Trial the Master Racing Tipster service free for 60 days! Save £24 on the cost of a seasonal subscription to the Football Investor service. Sign-Up Today And Gain Instant Access! The above is just a small snapshot of how the Smart Betting Club can help your betting, so why not sign-up today and take advantage of our Money Back Guarantee – available with our Gold and Platinum membership options. If after joining, you feel we are unable to help you make money betting (for any reason whatsoever) then you can request your money back no questions asked. You can also get started with us straight away with instant access to our complete service as soon as you join. Ensuring you can sign-up right now and delve head-first into the world of profitable betting with us! You make great betting profits, by following great betting tipsters! Well it is. And it isn’t. The tricky bit is finding the great betting tipsters in the first place. There are literally hundreds of adverts placed by “tipsters” claiming to have the best results. Who can you trust? Who has genuinely proven themselves? Who has fluked a few good results, but is guaranteed to fail in the long term? What you need is a tipster who has proofed his tips to someone who is 100% independent and who can be trusted completely. A tipster who has been monitored for a long time to make sure he really does have an edge over the bookmakers. A tipster who understands the value of customer service as well as the betting markets he works in. Our betting service Hall of Fame is designed to make sure that all of these checks on a tipster have been carried out and the necessary standards met. In other words, you know that if a service is in the Hall of Fame, then you’ve found one of those great betting tipsters we’re talking about, and that you need to be following. So how exactly does a tipster service become a part of this elite group? It proves every single one of their bets. It maintains an extremely high level of performance for a long period of time, usually at least 18 months and never for less than a year. It can produce an official record of all of their bets, detailing the losers as well as the winners. It demonstrates real professionalism – communication with members is strong, bets are released reliably, and subscribers can follow with confidence. It’s certainly not easy for a betting service to get into our Hall of Fame, and once they have made it in, they need to maintain the excellent profits they make for their followers to stay in. This is the cream of the tipping crop we’re talking about here. Join the Smart Betting Club today, for immediate access to all the current Hall of Fame tipsters. If you download our free sample Betting Magazine you will see a typical review of one of our Hall of Fame services…Price Power. So you can see straight away that here is a tipster with a long pedigree, who has been making superb profits for their members for seven years! Remember too, all these bets were proofed to the SBC, so you know that here is a service that will make you money. Price Power is a service that keeps things very simple. Bets are given out in very easy to understand emails, and all tips are advised at just £5 each way. You don’t need to be a high roller to earn excellent money from your betting with this service in your armoury. Translating this graph into pounds profit, then imagine you had just a £2,000 betting bank. You’d be taking an average of £2,400 clear profit from the bookies every year! These results were recorded at the end of 2014. So how has 2015 progressed? In 2015 to date, Price Power has made for their members another 1,465 points profit at an ROI of 9.3%! Clear evidence that the Hall of Fame rated Price Power’s wheels just keep on rolling, generating year after year of exceptional profit. But Who Is This Service Suitable For? As part of our review process, we go beyond just the bottom line results (important though they are!). If you are going to join a betting service, you need to know you’ll be able to follow it properly. Superb Profits…Easy To Follow…Discounts Too?!? Price Power is just one of 16 current SBC Hall of Fame services. All 16 have generated the same sort of profits over the long term, and have proven themselves to be true professionals in every aspect. You can’t help but massively grow your betting profits following these elite services. But we’re not content to simply point you in the right direction of who to follow. We want to help you make your betting be as profitable as possible, and to help you achieve this in any and every possible way. That’s why we set up the SBC member’s Discount Club, so that you can make big savings on subscription costs. We want your betting profits to go in your pocket, not taken by sign up fees. Take Price Power as a typical example. As an SBC member, you will have access to an exclusive saving of 20% off the cost of the Price Power subscription fee. And there are plenty of similar savings to be made when joining more of the very best tipsters of the betting world. How can you bet what the professionals bet for free? The best things in life are free…and that includes tipsters!!! We know what it is like when you’re starting to follow tipsters. You want to elevate your betting, right? Start generating consistent profits instead of frittering money away on daft bets or on silly hunches. The trouble is, it’s at the start of a betting journey that funds tend to be at their tightest. Perhaps you’ve scraped together enough for a betting bank of sorts, but hey…you could really do with getting off to a good start so that you can build things up and not risk going bust. Tipsters who are cheap – you can’t be eating up a big chunk of your bank in expensive fees. So What About Tipsters Who Make Fantastic Profits…And Are Free?!? Believe it or not, there are some exceptionally good tipsters out there who you can follow without spending as much as a penny. 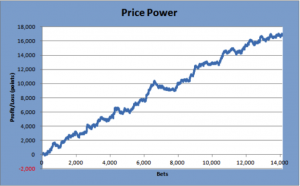 Jason James: 788 bets since July, generating 492 points profit. That’s £4,920 clear profit to just £10/point, in only 4 months!!! The Form Analyst: winner of our tipster talent competition who has grown a betting bank by 33% in four months! Compare this return to a bank offering an annual interest rate of 2%. Chris Patti: has generated a sparkling ROI of 26.1% from 160 tips. And what do these three tipsters have in common? Answer: as a Smart Betting Club member, you get all of their picks completely free of charge! The best thing about following these free tipsters is that it’s a brilliant way to build up a betting bank. You can start small. Stakes don’t need to be big when you don’t have subscription charges to cover, and the profits start to add up very quickly. If you simply reinvest some of the profits you’re making, you’ll be able to grow your bank quickly and easily. You can safely and securely raise your stakes, generating bigger profits. And then perhaps, you can start to look at building a portfolio of tipsters, further spreading and diluting the risk as a serious investor. It’s at this point that you might want to start looking at some tipsters that do charge for their expertise, and you’ll find a full run down on the very best the industry has to offer in the in depth reviews in our Betting Magazines. And remember, we’re completely independent. We take no cash for writing positive reviews. This means that when we say something is good, it genuinely is, and you can have 100% confidence. The SBC member’s forum is alive with exciting tipsters posting up their bets for free. Some of these tipsters decide eventually to turn “professional”, and start charging for their expertise. But there will always be a strong seam of free tipsters that you will be able to mine and generate superb profits from, taking the risk out of your betting.